Max: Okay. The other thing that we’re interested in talking to sanitation workers about is the first responder debate. Are sanitation workers first responders? M: Well, actually in some cases, no one else got there but us. We were the first ones there. No one else wanted to go in some areas, especially in Coney Island or down in Sea Gate. No one else came. I’m pretty sure when they had power outages, whatever, they had police available. But as far as taking away debris, there was no one else coming. We were the first responders. And not only were we the first; we were the best. You know? We were the best responders. And I’m not saying that to put down anybody else. I’m just saying that because we stayed with it all the way through. And we were the first responders in areas that nobody knew about– like I went to Sheepshead Bay and [Arlene] Avenue. It’s strange because if you’re driving up and down it, you wouldn’t notice them. But there were maybe a couple of dozen small houses. I guess at one time they used to be bungalows, but now they’re permanent. And we were the first responders because nobody else knew they were down there. Our sanitation guys knew where every little nook and cranny was. So we were the first responders. And also the best responders. I’m not trying to grab — you know, I’m sure the fire department would have been better in other ways. But in this situation, Hurricane Sandy, we were the best. Max: So as a first responder, what sort of things would you guys do? M: We cleared the streets. Like say for example, down in Sea Gate, you couldn’t even get through the streets. So we cleared the whole streets. We made it accessible for everybody else. Sometimes Con Ed couldn’t get to anything. And we had to make a path for them. So dozens of areas like that, especially people close to the ocean. “[At first] they didn’t consider us one of the first responders. I think that took a couple of weeks to straighten out. After it was straightened out it was okay. But you know what? It didn’t stop us because guys knew that there was a problem getting gas. They did what they had to do. If they had to leave a little early from home to go to a certain gas station, that’s exactly what they did. But I talked to a bunch of the police commanders, and they said that they would rectify it. I think he talked to maybe Commissioner Kelly and it got straightened out. But originally for the first couple of weeks, I think we had a problem with that. When it came to Sandy, we were first responders, but when it came to pick up gas…” [he lifts his hands and shakes his head]. Sanitation workers, whether they were in trucks or in the garage, worked twelve hour shifts following Sandy. They spoke with residents, community boards, and the Office of Emergency Management to ensure all needs were being met as quickly and as well as possible. And, as the sanitation worker quoted above relates, no one else could get anywhere until Sanitation had passed through. In general terms, a first responder is someone who is responsible for getting to the location of a crisis to provide assistance. Removing debris is often overlooked as a crucial form of aid that often has to precede other forms of response. After clearing sand and trees and other debris blocking roads in the first days and weeks after the storm, DSNY also removed moldy drywall and other contaminated demolition waste well into January. This waste posed a slower moving crisis for public health. In fact, today’s DSNY developed in response to an ongoing public health crisis characterized by epidemics and high morality rates for workers and newborns in the nineteenth century. During the DSNY’s two strikes since that time, public health became an immediate concern. One could say that sanitation workers are first responders that defer a chronic urban crisis-about-to-happen, not only during times of acute emergency, but all the time. “Being a sanitation worker is more dangerous than being a police officer or a firefighter. … Compared to all job categories measured, refuse work has ’10 times the overall on-the-job fatality rate,’ which puts it in a category that the BLS [Bureau of Labor Statistics] calls ‘high-hazard.’ Refuse collecting invariably involves jumping off and on trucks, carrying trash containers, and walking on streets, alleys, and parking lots…. 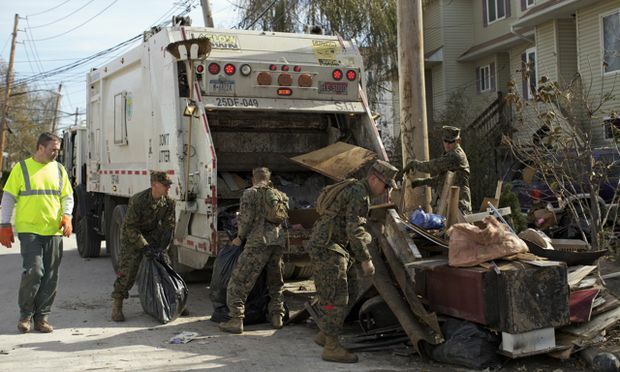 The BLS calculates that as of 2011 (the most recent year for which figures are available), refuse and recyclable materials collectors hold down the nation’s fourth-most-dangerous job, after fishermen, loggers, and aircraft pilots. The figures are equally startling when compared to other uniformed occupations. Sanitation workers are many times more likely than their counterparts in Police or Fire to be killed on the job” (Nagle, 57). If a first responder is someone trained to come to scenes of crisis, possibly at their own risk, to alleviate the burdens caused by the crisis, then the concept of first responder may have to be extended to include emergencies that are less acute. In fact, sociologists such as Kai Erikson have long argued that contemporary disasters are more chronic than acute, and more invisible and long-lasting compared to cinematic “events” such as Hurricanes. Present day disasters have to do with pollution, environmental health, and wealth inequity as much as they have to do with climate change and extreme weather. We need first (and ongoing) responders for these plodding crises as well, and sanitation workers may be the front lines across the board. Max Liboiron is a Postdoctoral Research Associate with the Social Science Environmental Health Research Institute at Northeastern University and a co-founding member of the Superstorm Research Lab. Interviews were collected with the Superstorm Research Lab, a mutual aid research collective. For more information on how this data was obtained, as well as other interviews about Hurricane Sandy, see www.superstormresearchlab.org. Erikson, K. T. (1995). A new species of trouble. WW Norton & Company. Nagle, R. (2013). 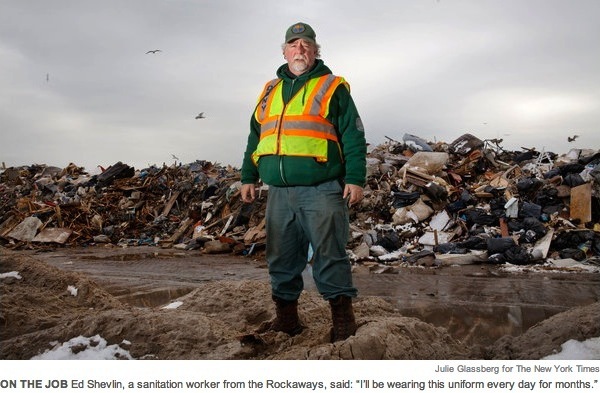 Picking Up: On the Streets and Behind the Trucks with the Sanitation Workers of New York City. Macmillan. In the weeks proceeding and following the one year anniversary of Hurricane Sandy making landfall in New York City, Discard Studies is featuring a series of articles about the complexities of disaster and waste. This entry was posted in Disaster, Disease, Labor, Sanitation, Urban, Waste and tagged Sanitation Workers. Bookmark the permalink.